Hey beautifuls, hope you all are doing great. Currently I am in my beautiful city of Kolkata. I love roaming the old streets and gorging on the delicious street food, but one thing that I have always repented while growing up in the city has been the extreme heat and humidity. But that does not make me stay indoors, specially this time as I have found one of the best ways to stay protected from the heat. 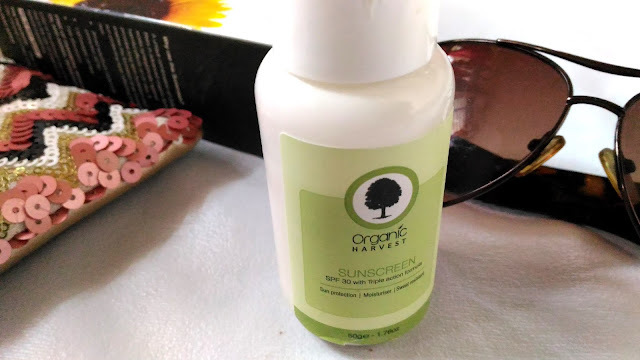 Today I will be talking about the Organic Harvest Triple Action Sunscreen with SPF30 which I am using currently. The triple action formula of Sunscreen Lotion SPF 30 includes natural preservatives that shield the skin from harmful sunrays whereas its sweat resistant formula ensures a carefree sun time, on the go. Packaging: Organic Harvest Triple Action Sunscreen with SPF30 comes in a deep green cardboard packaging. The bottle inside is white in colour with a white pump dispenser. My experience: Although I have dry skin and I generally like my moisturizers to be emollient, I prefer my sunscreens to be lightweight. 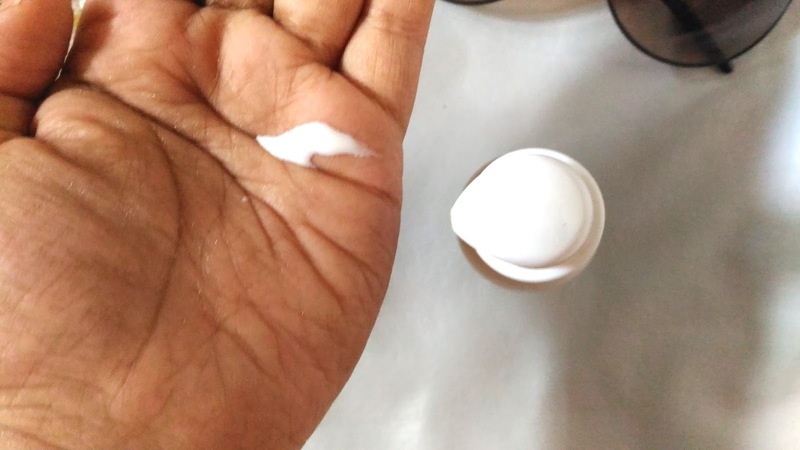 Thankfully, Organic Harvest Triple Action Sunscreen with SPF30 has the perfect consistency which is neither too thick nor too runny and is pretty lightweight. The packaging is very nice and smart and can be easily carried around. I like the mild fragrance too. The sunscreen is hydrating and water based and sits lightly on the skin, even if you are wearing a sunscreen underneath. 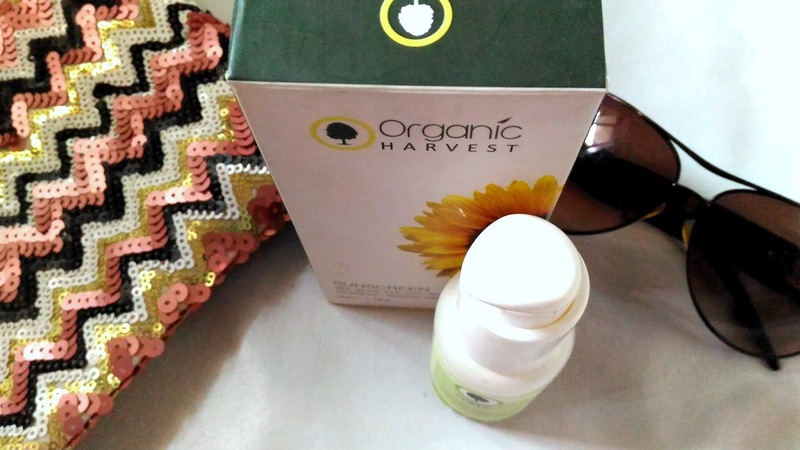 Organic Harvest Triple Action Sunscreen with SPF30 gives a beautiful radiance to the skin, and can be used under makeup too. I am sure it will be good for every type of skin. It shields the skin for a pretty 3 hours or so, after which I feel the need to reapply. The best thing about Organic Harvest Triple Action Sunscreen with SPF30 is that it does not make you sweat, which is very common in some sunscreens. 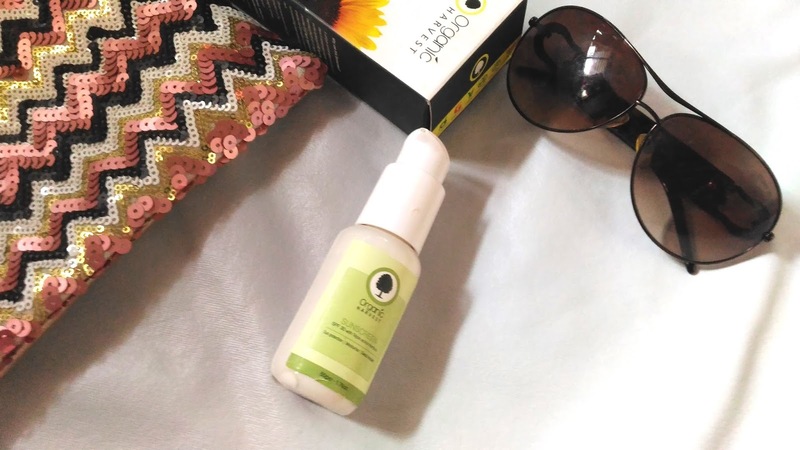 Organic Harvest Triple Action Sunscreen with SPF30 is truly a savior during the summer times. I am a huge fan of the lightweight and sweat resistent formula. It is a great sun-protection in humid weather.